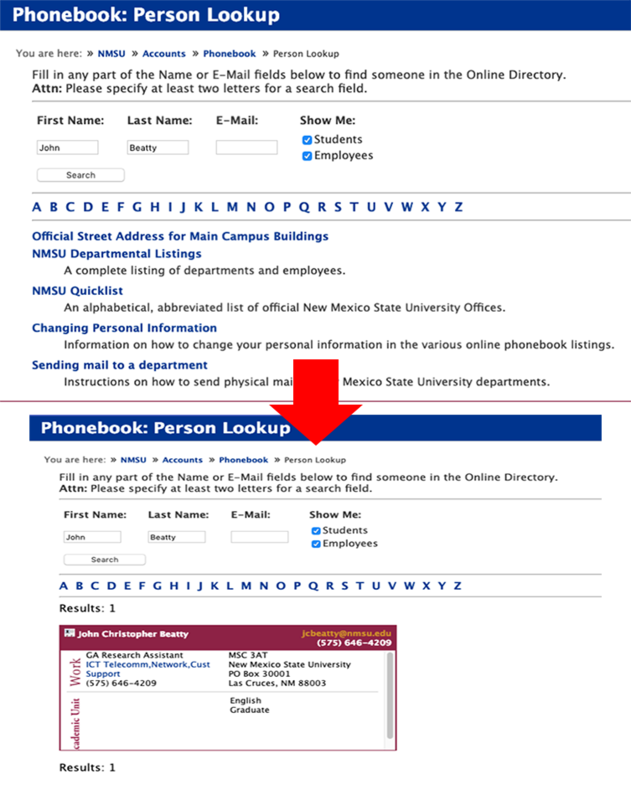 The NMSU phonebook can help you find the contact information for staff, faculty, and students. You can access the NMSU phonebook online by visiting myaccount.nmsu.edu. There is also a Quick List, of department and campus phone numbers, available online that you can download as a PDF. Open an Internet browser and type myaccount.nmsu.edu/phonebook into the search bar. You will see three entry boxes "First Name", "Last Name", and "E-Mail". You will need to enter information into at least one of these boxes before clicking the Search button. From the results, you will see either one name or a list of names and you can export the contact information by clicking on the Name in the results.